Pungent in taste and light in its effect. 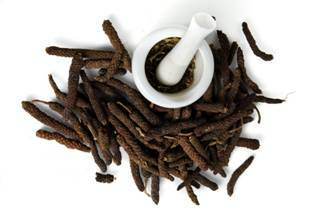 Hot in potency and sharp in nature, this medicinal herb confirms its antiquity beyond 2000 years. 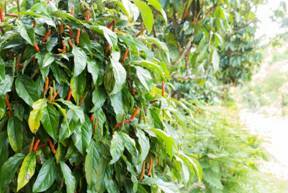 PIPPALI also known as Piper longum has been widely used for medicinal purpose since centuries. This is a Slender aromatic climber with perennial woody roots grows mostly in warmer parts of India, Central Himalaya to Assam, lower hills of West Bengal, Uttar Pradesh, Andhra Pradesh and Western Ghats. Pippali is a favourite household spice in Indian Kitchens, but lesser known facts are about immunity values of this spice. Pippali has been widely mentioned in Ayurvedic texts as an effective Rasayana (Rejuvinator) & Vajikarna. References have been found which talk about intake of pippali by saints of ancient times. Vedic scripts mention various herbs and spices which work towards increasing immunity and work as a preventive measure against many illnesses and diseases. Various studies and researches have confirmed over the years that regular consumption of pippali in appropriate quantities along with other ayurvedic immunity herbs or sometimes with simple ingredients like milk or honey over days can give beneficial results. Pippali is known as “tridoshic” herb as it suits all body types. Thus regular consumption of pippali in suggested quantity can help you to immune your body to quiet an extent. Pippali has Anti-microbial, Anti-inflammatory activity. Consumption of pippali is said to exhibit anti spasmodic action and hypoglycaemic effect which is believed to lower blood sugar level. It is also reported to be antagonist in respiratory depression. Also due to its cooling post-digestive effect consumption of pippali is considered as a safe and effective option to avoid all sorts of digestive disorders. Due to these and many other health and immunity benefits of Pippali it is an vital element in Ayurvedic Pharmacopeia and can be found in numerous herbal formulations. Consume immunity boosting foods & try our home remedies to improve immunity. Visit our immunity blog to know all about how to increase immunity.